How can we expect teachers to change the way they teach unless we have changed the way teachers learn? About 12 months ago I found myself sitting in a conference surrounded by hundreds of educators on a topic of 21st Century education, delivered in an industrial-era paradigm. We sat passively, in a big auditorium, then we were herded like cattle to workshops where we sat passively in smaller groups. Something didn’t add up. Why was I there? There were big name speakers, who have something to say. But when I Googled them I found that what they had to say I could actually catch on a YouTube clip or read in their books. I am a self-motivated and self-directed learner. I seek learning opportunities, so why would I attend PD? 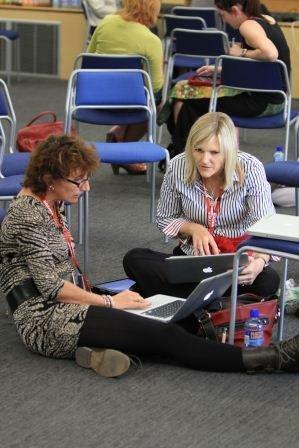 Don’t we often say that the best thing about a conference was the conversations at the coffee break? But sometimes, isn’t it great to get away for the day, think about new things, engage with new people, be in a different physical space and have a nice lunch? Absolutely, but often in doing that we put up with content that can be accessed ourselves and reinforce outdated methods of delivery. Unless we change the default setting for professional learning, we cannot expect teachers to think differently. They need to experience professional learning another way. Event-hosting companies have tapped into this market, with a commercial agenda. They have the capital to attract big names, get big sponsorship and roll out big marketing, yet don’t have the foundational thinking to change the content delivery method. Educators have just become their new market. As we organise the Rwanda Open Summit to be held later this month I am reminded of the importance of thinking differently about how we engage learners. With incredibly high youth unemployment rates it is clear that there are significant gaps in the children’s learning. One of the people attending describe the approach to school in the region as “learn by rote and rule by fear”. Sadly, in developing nations the default approach to education reflects an aspiration of a western culture that we have now passed by. The model of education that these young people desperately need is one that can leap-frog from the 1950’s British command-and-control era to the 21st Century knowledge economy. The access to technology, wireless and 3G networks and mobile devices can make a difference to the quality of teaching and learning. This is not just for the students, but essentially teacher pre-service and in-service education. Newspaper reports this week predict the peak of the baby-boomer retirement in the next couple of years. Thousands will be retiring and thousands of young teachers will be needed to replace them. It is imperative that we implement new approaches to conferences and PD, ones that provide opportunities for professional dialogue and networking. We need to rethink and present meaningful PD for educators that will model and give hands-on learning experiences, replicating the ways that engage and inspire young people. There is still the place for expert content and guest speakers, but can we become more creative about the program and provide opportunities for meaningful connection and sharing ideas? We can’t expect teachers to change the way they teach until we change the way teachers learn.